I know that Christmas is less than a week away but I'm going to take a small break. David is off work until the new year and we will be spending lots of time together as a family. I wanted to share a few random tidbits about me and Christmas. * David and I have only had a real tree once or twice since getting married. We were given a fake by my grandparents after getting married. Then a few years ago we purchased one with the lights attached and I gotta say it's hard to beat. * We don't have a "theme" for our tree and never have. We always have random ornaments that we've collected over the years and I love it! Maybe someday we might if we have enough room to have 2 trees. * We usually celebrate Christmas with David's side a week before Christmas due to his brother's work schedule. We actually really like doing it this way because we get to spread out the fun rather than having it all smooshed into 2 days. *David and I don't like the traditional Christmas food fare. My side will do the traditional food, but when we celebrate with friends or his side it's always something non-traditional. This year it will be sandwiches with his side and street tacos with the friends and vodka pasta for us. * We celebrate Christmas with our besties "the K's" every year. We take turns hosting the celebration and we girls get excited because we know that we get to use our china at least every other year! * David and I actually like going to the mall on Christmas Eve. We are never there to shop (we're always done before then) but we love to go and watch people and just take in the Christmas spirit. We try to do it every year. * When David and I were engaged he wanted to start a new tradition and picked going to a movie on Christmas Eve. We included my sisters and kept it up until Trey came along. We'd like to restart it again in the future when Trey is old enough to enjoy the movie. * David and I exchange gifts and stockings with each other as well as with Trey. David loves doing stockings. * We love Christmas music. Our favs are: anything by Bing Crosby, Oh Holy Night, I'll be Home for Christmas and the Chipmunks. *Our favorite Christmas movies are: White Christmas, Christmas Carol and a Christmas Story. * We go to a Christmas Eve service every year. This year we'll be going to LifeChurch's service. * This year we'll be celebrating just the 3 of us on Christmas Eve and my side on Christmas Day. * Every year David and I open our gifts to each other Christmas morning (with Trey now of course). He usually fixes cinnamon rolls the day before and then we bake them when we wake up. We start a fire and turn on some music and then exchange gifts. This year we'll be fixing something different for breakfast, something with a lot less sugar! * My side of the family is big on traditions, David's isn't at all. With my side we read the Night Before Christmas and then the Christmas story from the Bible before we exchange gifts. Thank you for taking time to read my words, it means a lot to me! I want to wish you all a Merry Christmas and Happy Holiday's. Last year I saw some pillow covers on Etsy that I loved. But I didn't love the price especially since I thought I could make them myself. I never got around to it before Christmas last year, so it was on my list for this year. I have 2 throw pillows on my couch with removable covers and that's where I wanted my new covers. I found some scrap fabric in the remnant pile at the store. I think it's a soft burlapy kind of fabric. I had enough to make 2 covers and whipped those up pretty quick. Then they sat on my desk for a long time. I knew I wanted to use my cricut to make some stencils and then use fabric paint. I used some freezer paper to cut the stencil and then used my iron, without steam, to get it stick to the fabric temporarily. I'd never used the freezer paper as a stencil before but it worked really well. I guess since I ironed it down it kept paint from seeping under it. I didn't have the exact color green I wanted so I just mixed 2 together to get what I wanted. After painting the words I just peeled the paper off easily. Here's a couple of other views. I really like how they turned out. I wanted them to add a little Christmas without being busy and they look great! And very inexpensive to make since I only bought the fabric and it was super cheap. Yeah! Ok, here's my Christmas decor for this year. I have to say I'm enjoying it much more this year. I've parred down and added simple items. I used a lot of pine cones and some Christmas tree branches cut from my sister's tree for most areas. First our bedroom. The white is salt, used for making ice cream, in a glass bowl that was my grandmother's. I did buy a couple of packages of glass balls in the turquoise and teal. The bowl is sitting on a very old reprint of The Night Before Christmas and a copy of I Believe (it actually was a botched print as there are 3 copies of the story bound in one book). Just a simple set up which brings a bit of Christmas to our room without making it cluttered and heavy. Glass balls, pine cones, tree branches and this lovely little sign. This set up is in our master bathroom. I really love how this looks with some tree branches, a vase I found this summer at a garage sale, a canvas I painted last year and a clearance glass ball. So simple, light and natural. LOVE it! This is in Trey's room. The house was given to me by my grandmother my first Christmas. It's suppose to plug in and be a sort of nightlight and a music box that winds in the back. It has pics of Santa and elves and reindeer on it. Over the years the cord has been damaged and so it won't light up but the music box part still works. One day I want to get the cord fixed. I had the pics of me receiving the Santa house framed years ago, so I always set them up together. And of course it seems fitting to put it in Trey's room. We put our tree by the fireplace this year. Since we don't have any furniture right there usually I liked the idea of not moving something out. I like it there by the fireplace especially when we light a fire. My glass nativity set on a china plate with greenery and my coffee table basket with left over glass balls in a bowl from my great aunt with greenery. Our piano. The green frame is up all year long, I just found a Christmas printable on Pinterest and stuck it in there. The silver vase I bought last year and just stuck some fake branches in it along with some more greenery. The candlesticks were glass that I spray painted to look like mercury (I'll share about that some other time). I used some extra glass balls on a china plate under a small cake dome. The sign in the back is hard to see even in real life, it's a canvas I painted last year, it says Believe. This is not a very clear/good pic but I still wanted to throw it in. The bottom shelf is another free printable from Pinterest, with my nativity snow globe. The next shelf just pine cones, glass and greenery. The picture is the original print of one of the pictures from David's book. The artist we hired was so kind in sending us all his original works for the book. I wanted to use some of them around the house since they are special to us and I love that they are black and white so they fit in easily. The top shelf. I just stuck a bunch of greenery in the vase that's usually up there, a clearish Santa sign leaning on the books, a large Santa ornament and another book illustration. The next shelf is the stacking dolls my parents got while in Germany. It's sitting on a red plate with some antique glass ornaments from my grandmother. And last but not least my mantle. It looks SO much better since last year! I was so excited to decorate it this year since I redid it in May I used an apothecary jar from last year and used some more salt in the bottom then added pine cones and 2 shades of green glass balls. A pine smelling candle with some greenery. The 3 glass jars are mason jars from my stash that have more salt with a votive on top. I got this idea from Pinterest as well and it looks great at night when they are lit with the glass and the mirror reflection. And it was cheap and simple. The joy canvas is one I painted last year as well and one of my favorites. Overall I'm very pleased with how things have turned out. I've mostly achieved my goal of a simple, natural Christmas. I wanted to bring in Christmas without it being busy and cluttered. I wanted to have light fresh colors, greens, whites, turq/teal, silver and then the rustic browns of nature. I have one more thing that I want to put up, that's in the works, I'm hoping to be able to share before Christmas! I'll be sure and let you know! In years past I'd decorate every surface with tons of "Christmasy" decor. It would be so overwhelming and cluttered and claustrophobic and I couldn't wait till Christmas was over to get my house back. Over the past couple of years I've been downsizing our Christmas decor, getting rid of stuff I didn't love. This year I'm really trying to decorate with natural items, soft colors and use my china and glassware. So this is what I came up with for my dinning table. Trey and I have been picking pine cones around the neighborhood for a couple of months so I had tons to decorate with. I found the white platter at Target and the glass balls at Hobby Lobby on sale. Then I made a table runner with some burlap from Hancocks. I love the way it looks and I love the way it fits in with the way the room is already decorated. And best of all it doesn't feel cluttered! Ok here's a few other pics of it. I'll show off more Christmas decor pics soon, as soon as I can get some decent pics. I'd love to see your pics of your Christmas table. Share a link or post a pic. For those that don't know, my hubby, David wrote a Christmas book a few years ago. 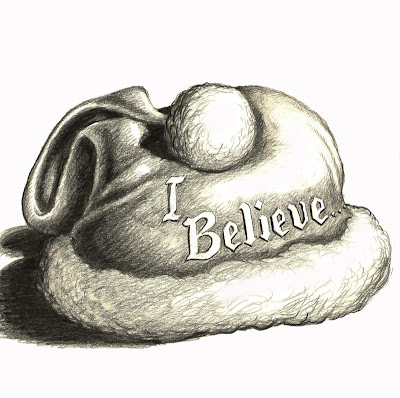 It's a story about believing. We have a blog called I Believe in Christmas that talks all about Christmas. You can find chapters of the book in the archives or you can order a paper copy. And we hope to have a free audio version available soon as well! We'd love for you to go check out the blog all season long for fun facts, stories and Christmas spirit!